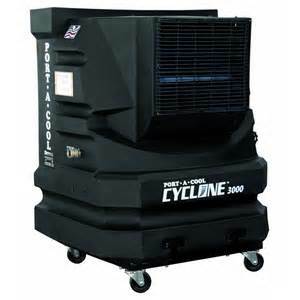 Portable PORT-A-COOL air coolers are a solution of economic evaporative cooling. Can be used in multiple sectors such as industry, automotive, agriculture, refineries, clubs, warehouses, offices, schools, universities, among others, to increase productivity employees, improve equipment performance and improve working conditions at a low operating cost and so friendly to the environment. These outdoor coolers have also proven useful in outdoor spaces, terraces or tents, which can be provided with a pipe system, which allows benefit from an efficient, economical and sustainable ventilation. The PORT-A-COOL portable air coolers need only electricity and water for operation, consuming 10% of the energy required by a conventional air conditioning. Also, it is very easy to maintain for any cooling application. No effect of moisture vapor or mist, air is only able to cool between 90 and 325 square meters. At the same time, thanks to its structure and high-quality evaporative pads, allows you to filter dust and clean the air so that it can refresh the environment in places like workshops and industrial hangars. PORT-A-COOL outdoor air coolers have seven models of different dimensions, ventilation devices with blades having diameters of 16, 24, 36 and 48 inches, depending on the needs of the space to be cooled. 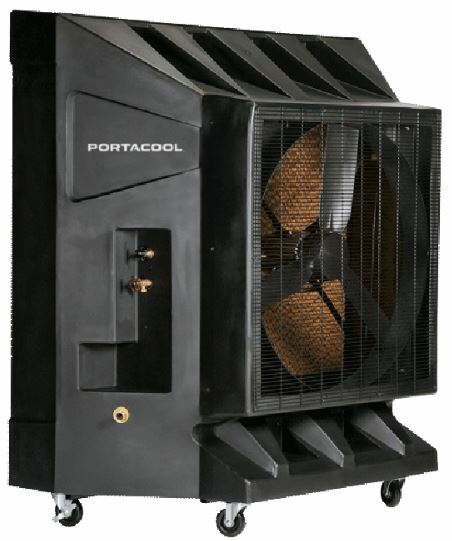 The Portacool Jetstream ™ 240 provides maximum adaptability to cool wherever needed. With the smallest footprint in the Portacool Jetstream Series, the Jetstream 240 is not only easy to move, but it fits in the tightest spaces. It’s a liquid level indicator, and an intuitive control panel makes operation is very simple. 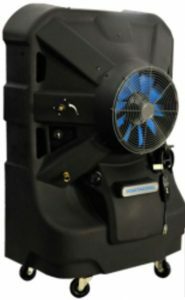 Keep your cool workers and productivity high with this rugged evaporative cooler. The only “tunnel” Deseño airflow goes further for maximum coverage. Comfortable workers are productive workers. Stay safe and productive with this powerful evaporative cooler. If space is limited and cooling is required, then the compact Portacool ™ 24 “portable evaporative cooler Variable Speed will help you beat the heat and finish the job. This easy to use product is the solution you’ve been looking to keep their cool and comfortable workers. 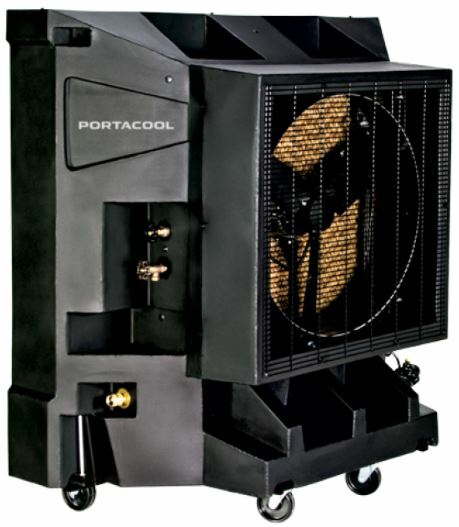 The Portacool ™ 36 “portable evaporative cooler can cool Variable Speed workplace hotter! Pleasant workers are productive workers. Just run your finger along the border of the highest plate and you’ll find a smooth finished surface. Just run your finger along the border of the best plate and you will locate a smooth finished surface. Obviously, this is all dependent on the temperature and humidity in the region where the unit is going to be used. While the four coolers discussed in this article have a great deal of the exact same features, they’re also different in some facets. Furthermore, the coolers don’t use any harsh chemicals that will hurt the surroundings. Since these coolers utilize an evaporative cooling technology, they are far less costly than traditional techniques of cooling. 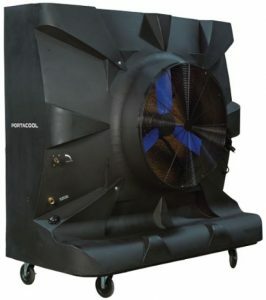 The cooler is extremely economical, especially if used in dry climates because in these sorts of areas, it’s more affordable than traditional cooling techniques. This cooler is quite eco-friendly. This customizable cooler will work nicely in practically any circumstance and set it’s needed the most. Ecological evaporative coolers are extremely effective where air conditioners aren’t practical or aren’t efficient. If you don’ change the filter when it has to be changed, you are going to have system that isn’t doing anything in any way. In addition to the 2 batteries, there are 2 filters that have the unit. The Port-A-Cool PAC-FILTER-48 Replacement Filters are offered for purchase to assist you accomplish the optimal/optimally cooling obtainable from the unit. In the event the water supply to your house has a great deal of sediment in it, this is quite the perfect system for you. Based on your specific need, the cooling power desired is very simple to realize. On the opposite hand, if you would rather continuous cooling capacity, and constant water, simply connect the unit to a normal water hose. The unit weighs 350 pounds, therefore it can readily be moved around by a couple of people. Or you could want to just try out or demo a unit for a couple days prior to buying. Furthermore, buying a unit will help you save you money year in, year out, season after season. This specific unit has the absolute most cooling power out of these four options, along with the most significant water tank. The cooling unit weighs 205 pounds, so that it is easily moved by one person, and it’s a more compact size so that it will readily fit through any door frames. This specific cooling unit is a good addition to any warehouse. Some of our finest features aren’t readily apparent, but you are going to appreciate the advantages during a lengthy time. A number of the best features aren’t readily apparent, but you’re going to appreciate the advantages over the time period. There is additionally the option of buying a remote 50 gallon water resource. It’s likewise an excellent choice for a residential patio. To start with, you have the choice of filling the 32-gallon water tank allow it to cool like that when maintaining complete portability. There are in fact two options which can be employed with these units.